Comedian and actor, Simon Day, has announced a live tour of his brand-new show, calling in at Bury St Edmunds on 12 October. In the first one-man show that he has performed for many years, “Simon Day In Character” will showcase a range of Simon’s best loved characters from stage and screen, brought together for the very first time. The star of BBC’s hit TV show “Brian Pern: A Life In Rock” will be brought to life in a live setting for the first time – a chance to see the aging prog rock star, humanitarian and inventor of world music, as he discusses rumours of his death and performs some live songs. The Fast Show’s pub bore and star of 2003 witness protection comedy, Grass, Billy Bleach, will be resurrected and speaking for the first time since being charged with making 278 sexist comments over a three-month period in his local Weatherspoon’s. Geoffrey Allerton, Yorkshire’s most under-rated poet, steps out of the Mallard Theatre and onto a stage near you, to recite work from his latest poetry collection ‘Making Time’. One of Britain’s most dangerous men and longest serving prisoners, Tony Beckton talks about his continuous struggle to adapt to life on the outside. He’ll be regaling the audience with stories of his hilarious and violent antics in prisons across the UK. Simon Day is “In Character” at The Apex on Thursday 12 October at 8pm. 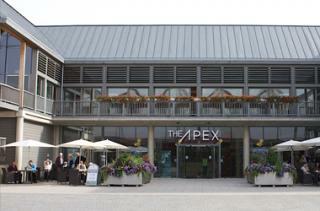 Tickets are £25 and £20, ring the box office on 01284 758000 or see www.theapex.co.uk for more information or to book.